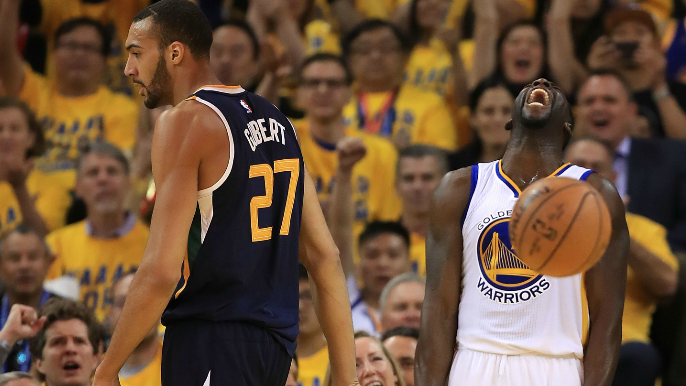 Draymond Green doesn’t have much sympathy for Jazz center Rudy Gobert. He explained why earlier this week. Some context: The Jazz center was brought to tears recently while discussing not making the All-Star team with reporters. After video surfaced, both Draymond and Andre Iguodala were quick to troll Gobert on Twitter. He gone cry in the car? Earlier this week, Green went on C.J. McCollum’s “Pull Up” podcast, and explained why he had an issue with Gobert crying over an All-Star snub. “I guess I was just raised a little different,” Green said. “That’s just not okay with me. I’m all for passion and people showing their emotion and all these things, but to cry that you don’t make the All-Star Game is a bit much for me. And credit to Rudy, he didn’t make it and he had 25 and 13 that night. Go do that though…credit to him for going out and having the game he had right after thinking he should have been an All-Star and not getting the nod. I respect that and I rock with that. Draymond also believes the incident may have cost Gobert some of his edge on the court. “Also, when you look at what we do, especially Rudy, Rudy’s a big man, he’s somebody who locks the paint down. He’s an intimidator. You do that and you kind of lose some respect from some guys that you got to play against. “So even more so than anything, the mental edge that he may have on someone, it takes a hit, and the mental edge can be exactly what gets you over the hump. The mental edge can be exactly what allows you to dominate one particular matchup. “It’s not necessarily the fact it’s a man crying — men cry, women cry, people cry, kids cry, everyone cries — but you’re crying over All-Star and we’re talking about basketball.